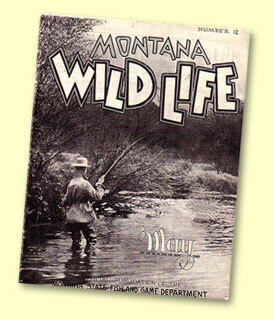 The Fur-bearing Trout - Myth or Marvel? The Fur-Bearing Trout is a species of fish that possesses a thick coat of fur to keep itself warm in the cold waters where it lives. These furry fish are primarily found in the northern regions of North America, but particularly in Canada, Colorado, Wyoming, and Montana. The species is also sometimes referred to as the Beaver Trout, or (incorrectly) as the Sabled Salmon. According to legend, the fur-bearing trout was first encountered by Europeans when Scottish settlers emigrated to Canada during the seventeenth century. One of them wrote home remarking about the abundance of "furried animals and fish" in the new land. Asked to provide more information about the furried fish, the settler duly sent home a specimen. If true, this legend would pretty much discredit the Colorado hair-tonic theory of the creature's origin. 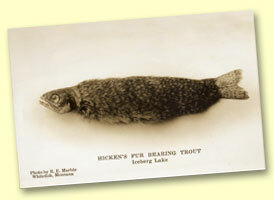 Fur-Bearing trouts mounted as trophies can be found hanging on walls throughout the Great Lakes region of North America. • Some say that the creature evolved its thick coat to protect itself from the extreme cold of northern waters. • According to another lesser-known theory, this species of trout owes its fur to four jugs of hair tonic that were accidentally spilled into the Arkansas River (in Colorado) sometime during the 1870s. A few researchers suggest that as the weather grows warmer during the spring the fur-bearing trout sheds its fur, only to regrow its coat as winter returns. This may help explain why trout with full coats of fur are so seldom encountered.